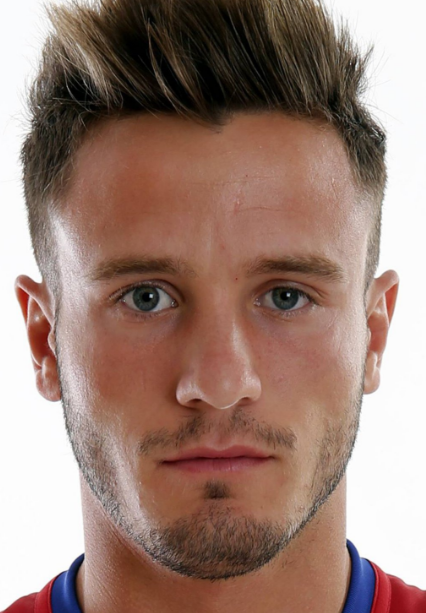 Saul Niguez is very excellent and talented player who plays for Atletico Madrid and Spain National team. He plays by wearing the shirt number of 8. He is one of the very key players. Previously, he had played for Real Madrid and now he is playing for Atletico Madrid. He plays in the position of Midfielder and passes the ball accurately to his teammates. He also played in the FIFA World Cup 2018 Russia. Saul was born on 21st November 1994. He was born and raised in Elche, the city of Spain. His full name is Saul Niguez Esclapez. He is the son of Jose Antonio Niguez and Pilar Esclapez, his father and mother. His nationality is Spain. His sun sign is Scorpio. Regarding his body feature, his height is 1.84 m. His weight is of 70 Kg. He has an attractive body figure. Saul started his career by playing in the Youth Team of Real Madrid. He then moved to Atletico Madrid in the year of 2008 and made his team debut in the season of 2010-2011. On 10th April 2011, he made his first goal to this club against Extremadura UD and second goal on 10th July against CD Arcangel. On 8th March 2012, he made hi official debut against Besiktas JK. On 21st April 2013, he made his La Liga Debut against Sevilla FC. Saul played the Semi Final of the UEFA Champions League against Bayern Much and scored a single goal on 27th April 2016. On 1st July 2017, Saul signed a new nine-year contract with this club, Atletico Madrid. Saul had represented himself in his national country, Spain in both senior as well as junior levels in many tournaments. He had played Spain U16, U17, U18, U19, U20, U21 and many other tournaments. Altogether, he had earned 47 caps from his national team. Saul was also crowned top scorer at the 2017 UEFA European U-21 Championship. His name was also enlisted in the squad of Spain national team in this World cup 2018 Russia. Saul is single. He is not married yet but he is in a relationship with Yaiza, his girlfriend. They seem to be very happy with each other. There is no any sign of Separation between them. The couple is living peacefully. The net worth of Saul is estimated to have around $10 Million. He makes a good source of earning by playing football. His annual salary is estimated to have £4.5 million. His current market value is around €70 million.